Smyth Naas present this landmark building for let on flexible terms. 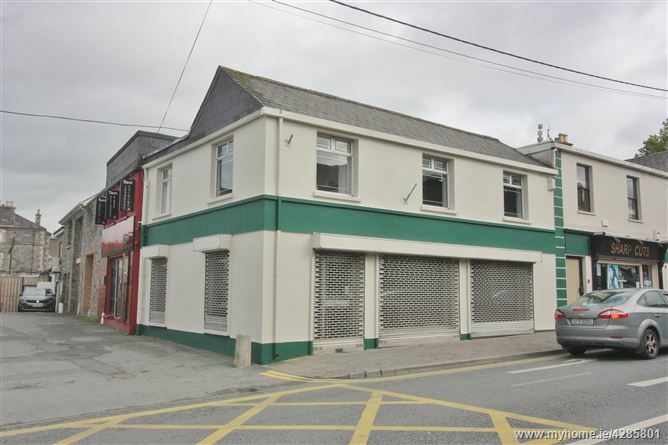 Standing on a corner site, this fine commercial premises offers excellent profile and would be excellent for a company headquarters or prestigious retail unit. New Row is situated just off the main street of Naas and enjoys an excellent footfall. The unit is positioned only meters from the busy corner of the Limerick Road and the high volumes of passing traffic make this an enviable location in which to do business. The accommodation comprises 48 square meters of downstairs retail space with 45 square meters of office/workshop space upstairs. From main street Naas, turn right onto the Limerick Road. The property is located just past Sharp Cuts on the right hand side.